Following their debut release Cross the Line in 2016, Orcadian folk Quartet FARA are touring the UK with material from their second album, Times from Times Fall. Comprised entirely of self-penned songs and instrumental tracks, FARA will celebrate the community which inspired them to become musicians – an album rooted in the spirit of the Orkney Isles and its people, it combines the unique Orkney fiddle tradition with contemporary and original songs and tunes. With the mission of creating something entirely new and collaborative, the four members of FARA have co-written many of the melodies on the album, blending all four distinctively different musical voices together, whilst also celebrating the unity of their musical beginnings. The songs incorporate words by Orcadian poets: George McKay Brown, Edwin Muir and Christina Costie, as well as one original and one traditional text. The Orcadian imagery running through these songs, alongside new melodies brimming with the islands’ tradition whilst also pointing in new directions, celebrates the ever-expanding Orcadian folk tradition. Fara’s new album is set to excite and delight. 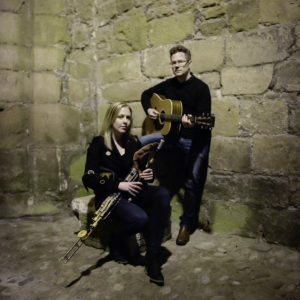 Hailing from the North West of England, Steven Johnston and Catherine Ashcroft have had a passion for Traditional Irish Music from an early age, in particular the music of the Uilleann Pipes. Steven is a member of Big Whistle Favourites Drop The Floor, his dedication to the pipes – and the Irish tradition serves as an example to many aspiring pipers. Catherine is known to many for her work with the duo Mochara, whilst not forgetting her prowess as a soloist and her revered piping in Riverdance. They come together at Big Whistle to unite their individual talents into a pure and cohesive expression of their art, true to the tradition yet very much in the here and now. Expect everything from breath taking dance tunes to soulful slow airs, as they combine their skills on Uilleann Pipes, Whistles and Guitar. A must see for Traditional Irish Music Fans.